At Great-Alaska-Seafood.com we make every effort to only sell wild fish and wild seafood products harvested in a sustainable manner. As pressure mounts on global fisheries, it is in a consumer's best interest to be know the sustainability of the seafood sold on the internet. We work hard to verify that the seafood we deliver to households across the U.S is certified as sustainable by the Marine Stewardship Council (MSC). The MSC has established fisheries guidelines that are consistent with those put in place by the United Nations. The MSC is an International non-profit organization that was set up in 1997 to find solutions to overfishing. 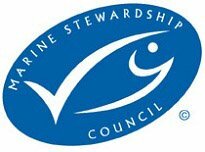 Today the MSC is recognized as the only environmental certification and eco-labeling program for internationally harvested wild fisheries. As a result, our customers can be assured that most, if not all, of the seafood we sell are products of fisheries that are certified sustainable, either by the State of Alaska and/or the MSC. Wild, Natural & Sustainable. From the Beginning. Since 1959, the Alaska Constitution has mandated that "fish... be utilized, developed and maintained on the sustained yield principle"
For further questions, please contact our Customer Service Team. We are ready to assist you.